Buyers are clearly anxious to take delivery of Audi's first dedicated electric car, the e-tron. 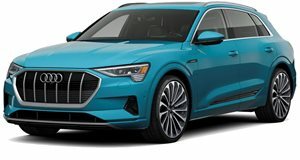 So much so that US Audi dealerships won't be getting any inventory, but will instead deliver the first examples to reservation holders who placed a $1,000 deposit. After the e-tron experienced delays, Audi has just announced that deliveries will begin in the US next month with demonstration vehicles arriving at dealerships. Even though we've known about the e-tron for a while now, its range estimates were a mystery. Until now. The e-tron has finally been given a range estimate from the EPA. But the news isn't great. The EPA says the e-tron will travel just 204 miles on a charge, which falls short of even the base Tesla Model Y's 239-mile range. For far less than the e-tron's $74,800 base price for the Premium Plus trim, Tesla offers a dual motor Performance model with a whopping 280-mile range. We saw a similar fiasco when the Mercedes EQC was revealed with only a 200-mile range, though Mercedes later said the car could do around 279 miles on a charge. Looking on the bright side, Audi says the e-tron can charge at a class-leading 150 kilowatts, giving it the quickest charge time of an electric SUV. Using a 150 kW public charger, the e-tron can replenish around 54 miles in just 10 minutes or 163 miles in 30 minutes. It may not have the longest range but the e-tron should at least charge in a hurry. Audi also mentions that the e-tron's batteries are "engineered to utilize 88 percent, or 83.6 kWh, of the 95 kWh total battery capacity," adding that "This engineering approach ensures battery longevity, repeatable performance and peak charging power for longer amounts of time during the charge cycle." Perhaps this approach is too conservative and has hampered the car's driving range in favor of quick charge times and longevity. Even the way the e-tron puts down power seems conservative. The full 402 horsepower is only available in Boost Mode, with 355 hp available the rest of the time. With Boost Mode engaged, Audi says the e-tron will hit 60 mph in 5.5 seconds and will be capable of towing up to 4,000 pounds with an available towing package.